This week, EWG uncovered that nearly 28,000 farmers have received farm subsidies or disaster relief payments for 32 uninterrupted years – totaling $19.2 billion. This news comes as Congress tries to impose new work requirements on parents with young children and older Americans who receive food assistance. On the topic of the farm bill, we took a look at a recent analysis by Harvard Law School that showed how hundreds of consumer and farming protection laws in all 50 states would be preempted by an amendment to the House farm bill. 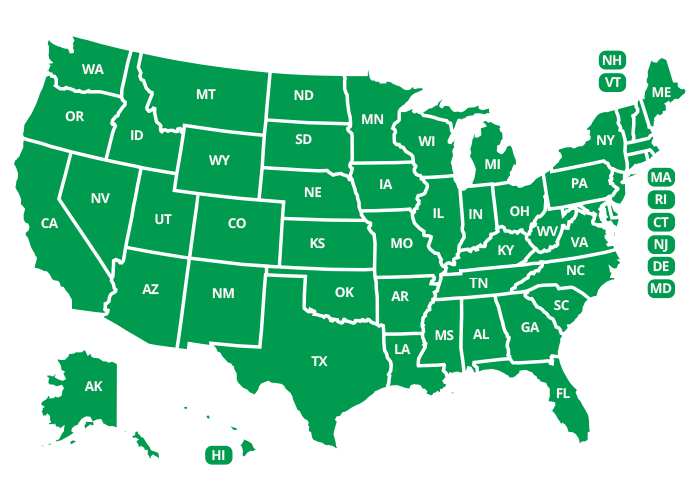 Our map shows which laws could be preempted in each state. EWG has long researched the health risks of chemical mixtures, so this week we reviewed a study published in peer-reviewed journal Toxicological Sciences, which found chemicals such as BPA, PFOA and methylparaben in the bodies of Americans. These chemicals are common in consumer products and drinking water. In troubling news out of the Environmental Protection Agency, last week the agency signaled that, due to industry pressure, it may plan to delay or scrap proposed bans on some uses of the drinking water contaminant trichloroethylene, or TCE. TCE is a chemical that the EPA has deemed as “carcinogenic to humans by all routes of exposure.” Drinking TCE-contaminated water has also been linked to birth defects, leukemia, and liver and kidney damage. As the summer fast approaches, outbreaks of harmful algae are starting to sprout up in lakes and other bodies of water across the nation. Following a recent report on the issue, EWG raised the alarm on an outbreak in Salem, Ore., that led to a do-not-drink warning for the city’s water supply. Stay tuned as we continue chronicling these harmful algal blooms throughout the summer and beyond. Since taking office, President Trump has indicated that his administration would go above and beyond to prop up the dying coal and nuclear industries. Last week, the president told Department of Energy head Rick Perry that his agency should head off the closure of coal and nuclear plants that are hemorrhaging money. Recent analysis has shown that these sorts of actions would be catastrophic for human health and cost utility customers billions of dollars. Nearly 28,000 farmers have received USDA farm subsidies or disaster relief payments every year for 32 years — adding up to more than $19 billion in assistance, according to a report from the Environmental Working Group being released today. The average payment was $687,204, according to the report. One farm in Sondheimer, La., raked in $11.3 million in subsidies between 1985 and 2016. Nine other farms across the country received $8 million each. About 28,000 US farmers have received a form of government support for 32 consecutive years, according to an analysis by the Environmental Working Group. The group, which has criticized the nation’s farm-safety net system, says subsidy and disaster relief payments to the farmers totaled more than $19B between 1985 and 2016, with the average payment for the 32-year period totaling $687K. But Scott Faber, the Environmental Working Group’s vice president of government affairs, said its inexplicable that some farmers have received a payment each year when there have been both good and bad years in the farm economy. “It’s just hard to understand how someone would have gotten a payment every year for the last 32 years,” Faber said. The Republican congressmen charged with writing the nation’s Farm Bill like to jabber about how people on food stamps need to get back to work. But those same lawmakers have helped secure billions of dollars in taxpayer-funded subsidies for big commodity farmers in the last three decades, a report released Wednesday by the Environmental Working Group found. A new analysis by the Environmental Working Group shows that for over 30 straight years, over $19 billion in taxpayer funded federal farm subsidies have been paid out to farmers. EWG Senior Vice President Scott Faber says that covered the years from 1985 to 2016. A draft report from the registry said the risks from exposure to a subset of PFAS chemicals “pose a significantly greater threat to human health than previously estimated,” the letter released Thursday through the Environmental Working Group said. Safe exposure levels to PFAS chemicals are 10 times lower than the EPA’s non-enforceable guidelines, the group said. The mission of the Environmental Working Group (EWG) is to use the power of public information to protect public health and the environment. Reprint of news release. Jefferson Public Radio: IJPR: Toxic Algae Blooms Reach "Epidemic"
The Environmental Working Group calls the spread of harmful algal blooms an epidemic. Oregon has had a program to track blooms and inform the public for years now. Craig Cox from EWG visits. The Environmental Working Group, a nonprofit scientific research organization, has found news reports of almost 300 toxic blooms of the same blue-green algae that is causing problems in Salem’s water, and has been since 2010. The problem, they say, is getting worse. Bill Walker, editor-in-chief and vice president of Environmental Working Group joins us. Toxic algae blooms are spreading throughout the U.S., according to a recent report from Washington, D.C.-based nonprofit Environmental Working Group. One of the first known incidences of toxic algae blooms contaminating drinking water was Lake Erie in 2014, affecting residents of Toledo. Craig Cox, the Environmental Working Group's senior vice president for agriculture and natural resources, said in a statement, "Toledo was a wake-up call for many people." A 2017 study by the Asbestos Disease Awareness Organization and the Environmental Working Group (EWG) shows the U.S. imported an estimated 705 metric tons of raw chrysotile asbestos in 2016. A startling study from the Environmental Working Group in 2005 documented an average of 200 toxins in the cord blood of newborn infants. It's no coincidence that childhood rates of birth defects, developmental disorders, cancer, asthma and food allergies are increasing. The bill, which will now be taken up in the Senate, is sponsored by the Environmental Working Group. But if the telecom industry association isn't sounding any alarms about the potential dangers of cell phones, the Environmental Working Group, known as EWG is. "EWG first got involved in the cell phone issue years ago where we posted on our website the SAR, the specific absorption rates for your cell phone and it busted our servers." Bill Allayaud is legislative liaison for EWG in California. However, Melanie Benesh, legislative attorney for NGO the Environmental Working Group, told Chemical Watch the problem formulations suggest that the pending bans for uses of TCE and NMP will not be similarly revived. "It seems pretty clear those rules are not going to be finalised," she said. The approach reflected in the problem formulations makes the TSCA risk evaluations "about as narrow as they could be," Melanie Benesh, legislative attorney for the Environmental Working Group (EWG), told Chemical Watch. The Environmental Working Group added: "These woefully incomplete problem formulations signal the EPA’s intent to discount human health risks to justify weak regulations of these chemicals." “Non-toxic means free from undesirable ingredients listed by the Environmental Working Group. This is better than claiming natural or organic as they are products that perform without compromising safety. People want natural because they assume natural ingredients are safe, which is not necessarily the case. They also may not be as effective as synthetic materials." So if you do use these hair products, how much and how often do you need to use them before they pose a risk to your health? “Unfortunately, there’s no really good answer,” says Nneka Leiba, director of the Environmental Working Group’s healthy living science team. Tracing a health problem to specific chemicals in consumer products is tricky. The other thing to think about, safety-wise, are all of the products you use. The Environmental Working Group is a great resource to see if the products you are using are safe. After doing some research, I settled on using California Baby products for bath time. Metro: Does your toothpaste have this common ingredient that could wreck your gut health? If you want to track down whether your other personal care products have triclosan, you can turn to the Environmental Working Group, which has a guide to consumer products that have the ingredient. Warning: You will find everything from hand sanitizer and antibacterial hand soaps to face cleanser on this list. People’s Pharmacy: How Can You Keep Mosquitoes Away? Both Consumer Reports and the Environmental Working Group (EWG) suggest that oil of lemon eucalyptus and picaridin can each serve as an alternative to DEET. They are quite effective repellents. Brand names include Repel Lemon Eucalyptus, Sawyer Picaridin and Natrapel Picaridin. According to the Environmental Working Group (EWG), the top five vitamins that Americans don’t get enough of are vitamins D, E, and A, as well as the minerals magnesium and calcium. Let’s take a closer look at what problems a deficiency (or, in less severe cases, an inadequacy) can cause. Here's the real issue though: "Some farm-raised varieties are artificially dyed pink and others have been found to have traces of antibiotics used to treat the fish in their crowded conditions. According to the Environmental Working Group, imported farmed salmon is also one of the top five foods with the worst environmental footprint," she says. Be sure to check labels, and stay safe. Before It’s News: What is the safest source of fish? Strawberries topped the Environmental Working Group’s “Dirty Dozen” list, meaning the fruit has the highest amount of residual pesticides. It’s best to buy them organic. Add a serving of these into your smoothie for all the immune-boosting vitamin C you need in a day. Make two copies each of the Environmental Working Group's 2018 "Clean Fifteen" and "Dirty Dozen" lists, which rank this summer's cleanest and dirtiest produce, from a pesticides' perspective. Research has linked exposure to these chemicals with potential fertility and neurological problems. Tape one copy to your fridge and keep one in your wallet—that way you'll always have a handy reminder of which summer superfoods have the least amount of pesticide residue (avocados and sweet corn) and which hang on to the most (strawberries). The Mercury News: Which of your fruits and veggies are the dirtiest? And the winner of the fruit with the most pesticide residues goes to…strawberries. For the third straight year, strawberries topped the Environmental Working Group’s Dirty Dozen list of fruits and vegetables laden with the most pesticides. The methane gas emissions and the amount of feed required for lambs are almost similar to that of beef, according to the Environmental Working Group. This makes it the worst animal protein for the environment. Not all produce is created equal. Health expert and trainer Joey Daoud of New Territory Fitness points consumers toward the Environmental Working Group's Dirty Dozen list of fruits and vegetables found to contain the most pesticide residue. These foods — including strawberries, spinach, and apples — "are definitely worth the extra money to buy organic," he says. Reprinted by MSN. Eating lots of veggies is a clear win for good health and diet, but eating only organic vegetables ensures that you and your family eat veg that’s free of chemicals and unwanted pesticides. This list from the Environmental Working Group can help you decide when eating organic is a must. The Environmental Working Group’s guide to pesticides in produces features a “Clean Fifteen” List that includes avocados, onions, papayas and more. “You can save some money here by not buying organic,” says health expert and trainer Joey Daoud of New Territory Fitness. According to experts at the Environmental Working Group, some sunscreens contain chemicals that could be putting your child in danger. Reprinted by ABC Montana. When it comes to selecting the best sunscreen for your family, the Environmental Working Group’s 2018 Guide to Sunscreens can help. The annual resource rates more than 200 sunscreens based on the UVA and UVB protection they provide, plus the ingredients they contain. “Not all sunscreens are made equally … People think that if they pick up a sunscreen product, it meets the same criteria as the one beside it, and that’s not the case,” said Nneka Leiba, director of Environmental Working Group’s Healthy Living Science program. According to the Environmental Working Group, about 12 percent of beach and sport sunscreens contain this Vitamin A. Always check the label before buying to make sure your sunblock is Vitamin A free. However, the Environmental Working Group – which released its 12th annual Guide to Sunscreens that reviews the safety and effectiveness of more than 1,000 sunscreens, moisturizers, and lip balms that advertise sun protection – is critical of sunscreens. In its new report, Environmental Working Group claims that 73% of the 880 sunscreens it tested don't work as well as advertised or contain "worrisome" ingredients such as oxybenzone, which they claim is a hormone disruptor and retinyl palmitate, which according to government studies on animals caused they developed skin tumors. EWG recommends choosing products with zinc oxide and titanium oxide instead. Instead, according to the nonprofit Environmental Working Group (EWG), there’s been a dramatic five-fold increase in the number of sunscreens advertising SPF 70+ or SPF 100+ since then. Regardless of the SPF, it’s important to apply one ounce (two tablespoons) 30 minutes before going outside and reapply it every two hours or immediately after swimming or sweating. CNY News: Should You Throw Out Your Sunscreen And Start Over? After reading a report from Environmental Working Group on sunscreen, I ended up throwing away ALL of my sunscreen! Some of what I had was too old and others had cancer-causing chemicals in them. Yikes! Every year, I browse the Environmental Working Group’s report on the best safe sunscreens for kids and babies. This list measures popular brands against the EWG’s standards, including everything from worrisome ingredients to false marketing claims. Reprinted by MomBloggers. Every year, the Environmental Working Group publishes a comprehensive report on the safest sunscreens on the market for human and environmental health. Check out their survey of this summer's sun protection and read up on the one environmental toxin you should never have in your sunscreen (Hawaii has gone so far as to ban sunscreens that have it! ).